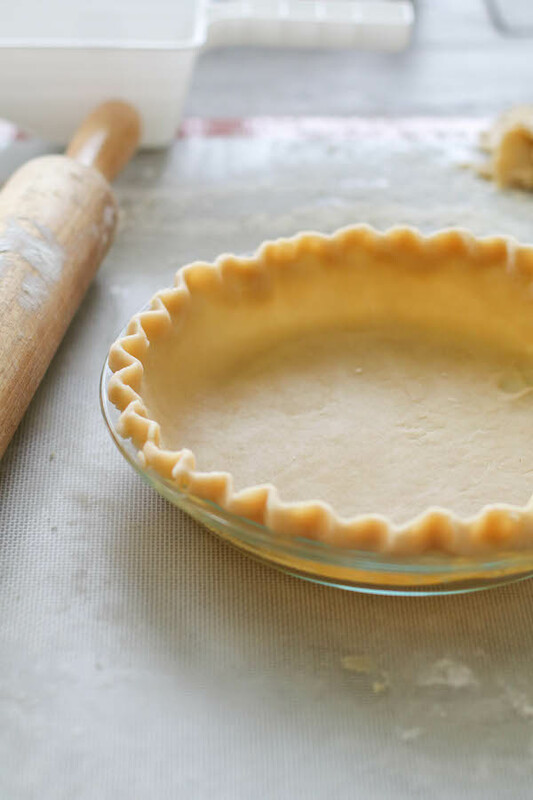 Thick, flaky and easy to work with, this pie crust recipe will be the recipe you know and trust for years to come. Give it a try once and be converted! Blend flour and salt in mixing bowl. Add in both kinds of shortening. Using a pastry cutter, cut shortening into flour to create small lumps about the size of peas. Set aside. In a small bowl, whisk water, egg and vinegar together. Slowly pour in water-egg mixture into the flour mixture going bit by bit, using a fork to stir and moisten. You will most likely not use it all. Use just enough to form a dough. Half way in, you will start using the heat of your hands to form dough into 5 balls. Do your best to not work or knead the dough. Once your dough comes together into 5 balls, store wrapped in plastic wrap or small freezer bags. Refrigerate an hour or two before rolling. Store remaining dough balls in freezer for up to six months. Defrost in the fridge for 24 hours before rolling.